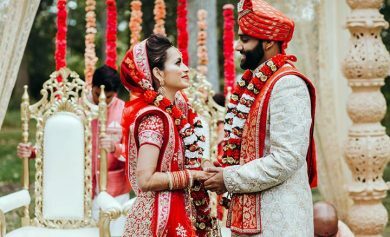 When you think of your wedding day – your wedding theme, attire, jewelry, makeup and styling occupy the top slot on your priority sheet. And one of the things to occupy the least priority would be the nails. And why not? 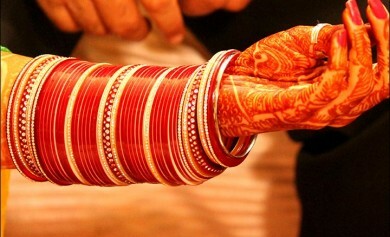 The traditional practice has dictated a standard double coat of red or pink for the nails and nothing more. 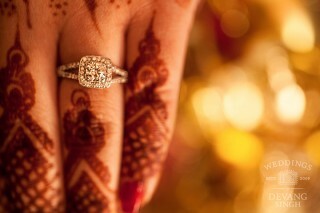 But now with a variety of interesting and intricate bridal nail art designs to choose from, it’s time we ditch the norm. 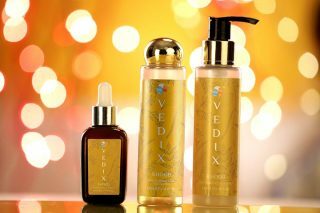 From acrylic to velvet to holographic, there is something for every bride. 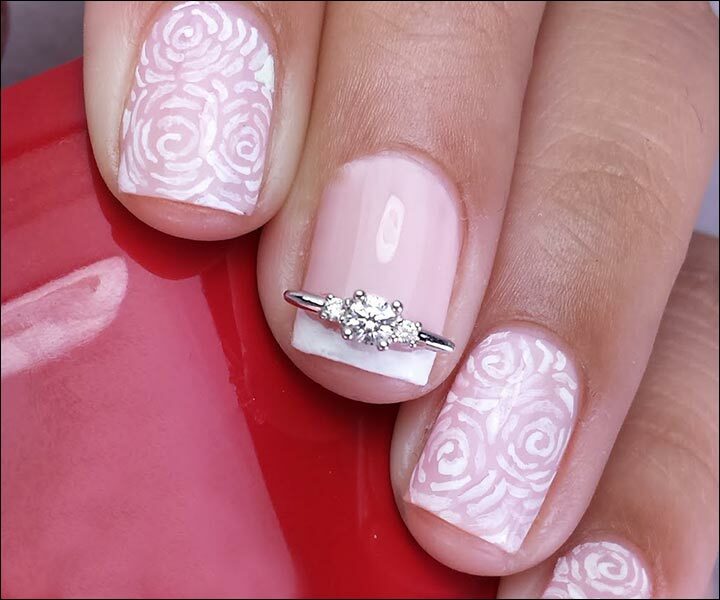 In order to get you kickstarted in the amazing world of the bridal nail art, we have shortlisted 33 amazing ideas that promise to catch your partner’s eye ( as well as the guests’) as you sparkle down the aisle. 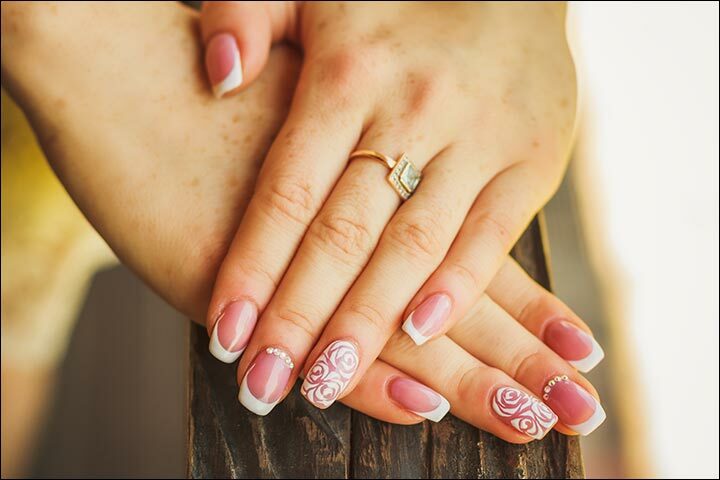 What’s more, we’ve included 10 step by step video tutorials to guide you through the process and important FAQ’s you need to know about the bridal nail art before you take the plunge. 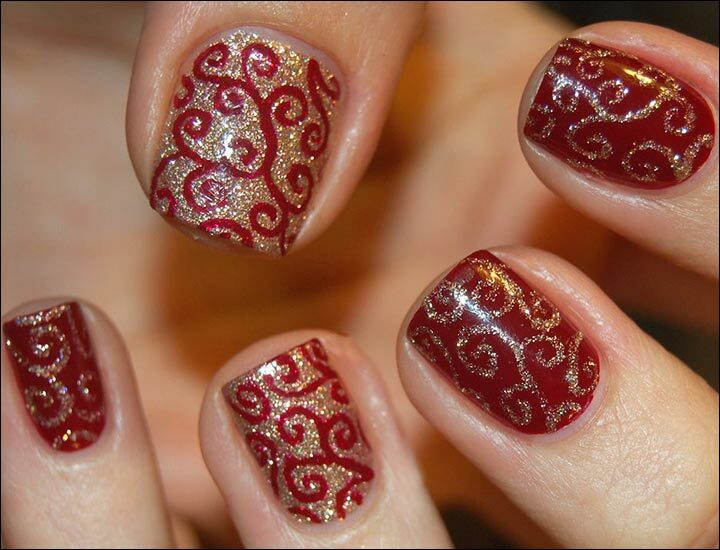 A simple and elegant red-gold swirl design that works even on short nails. This is an easily achievable dual colour nail art. It takes nothing more that the two colours and a toothpick! This is best suited for first timers. Another red and gold swirl design, this one employs stones and beads. This simple DIY pattern is explained beautifully in this step by step video. 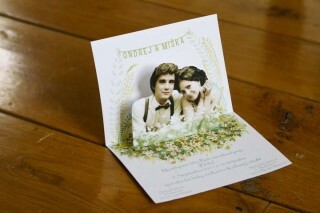 A beautiful and cute design that looks elegant and accentuates the bride’s beauty. This textured nail design looks difficult but is in fact very easy specially if you know the hack. 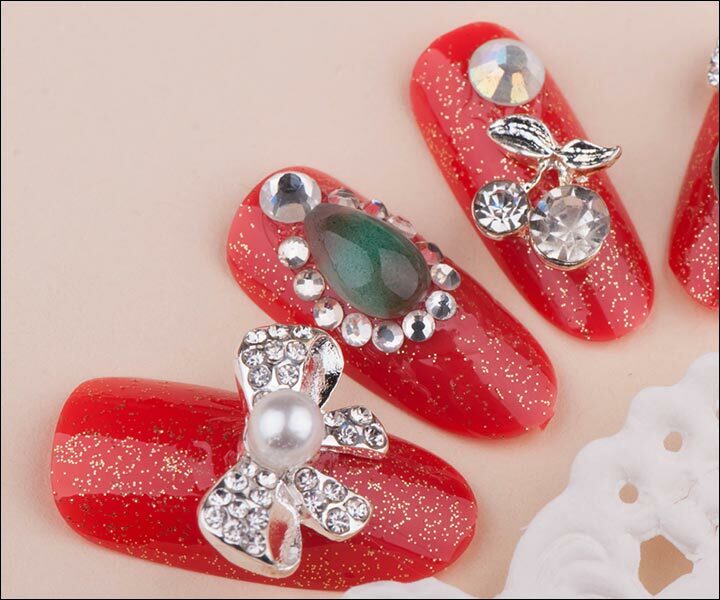 Tip: You can now find nail stamps in the market in various varieties. Choose any that you like and stamp away! 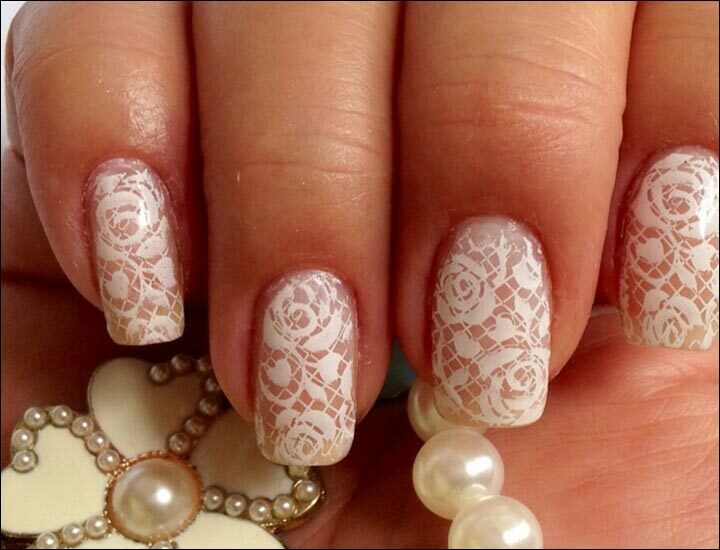 An absolute beauty, these nails are bound to catch eyes for their delicate pattern. This pure white lace pattern with French roses seems extremely fragile and exquisite because of its intricate pattern, but in all honestly, these are pretty simple. 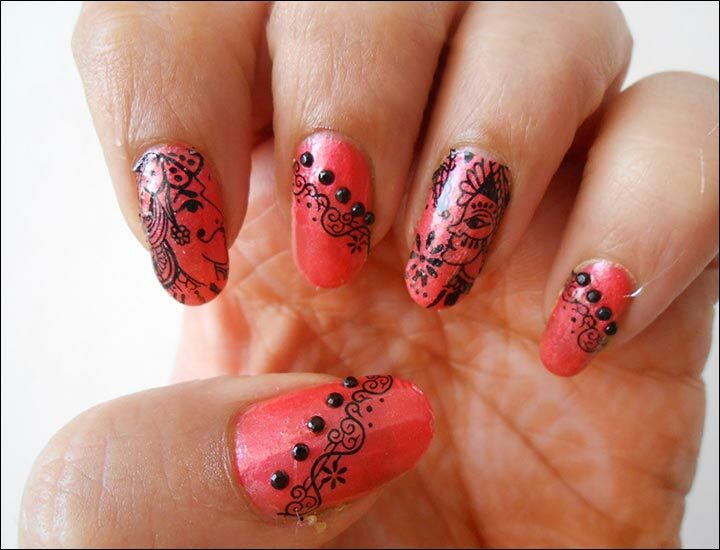 Just buy yourself nail art stencils of your choice before hand and simply paint the colour through it. Voila! 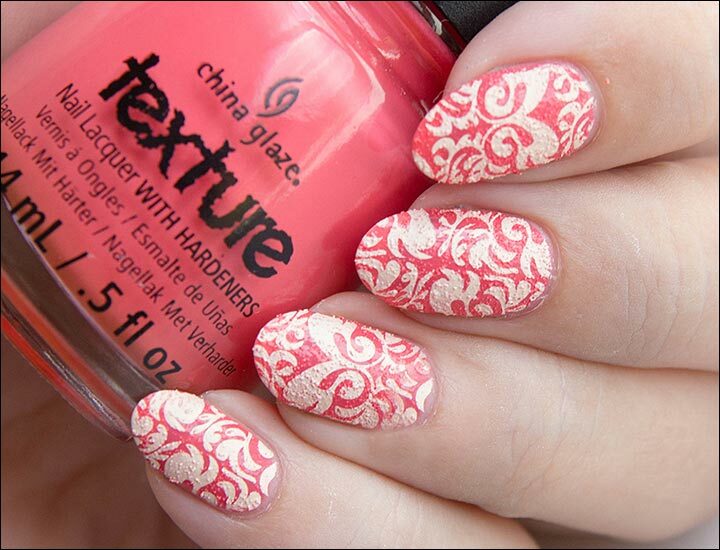 The most delicate and beautiful pattern on your nails! Here’s another video that shows a step by step method to achieve those absolutely professional looking lace French black and white nails. 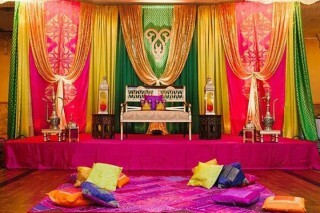 One of the more intricate designs, it is still easy to achieve this look. 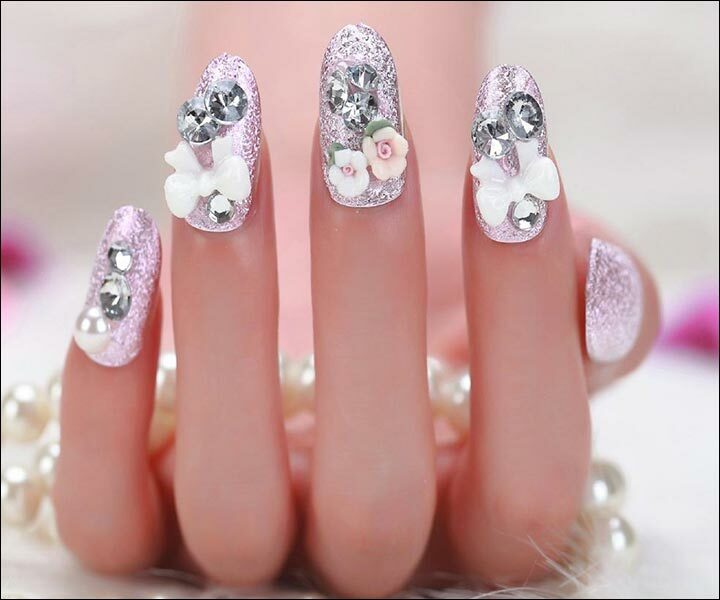 All you need is a shimmer pink polish, some glue, rhinestones and acrylic bow and flowers. This blingy design can really pop your nails out. This video does a great job of explaining how to arrange the pearls and beads. You can replicate this method =to apply rhinestones and other accessories too! A complex design to look at, but indeed a rather simple concept. All it needs is a translucent glitter, rhinestones, silver beads and a butterfly ring to replicate this sweet design. 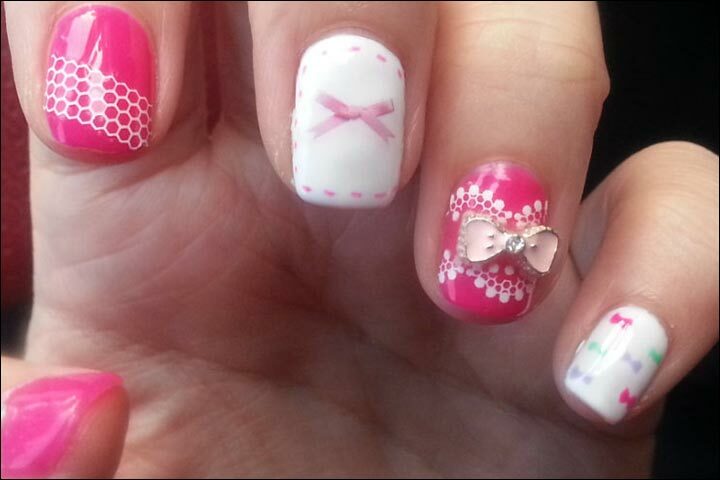 This cute pink and white nail art packs a lot. It includes lace, rhinestones, acrylic bows and even tiny coloured bows. It does a good job at looking absolutely cute! These mini tuxedo and gown creations are the best thing ever! Check out the video to know how you too can get them. This slightly complex pattern requires a bit of skill and a fine brush. But if you could perfect it, it is the most incredible thing ever. This video gives you the best tips and tricks to perfect the one stoke technique. A little practice and you are bound to do it like a pro. Another easy yet elegant short nail design that is quick and easy. 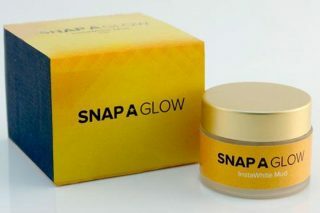 You’ll only need a glimmer polish and some stamps, and you are good to go. 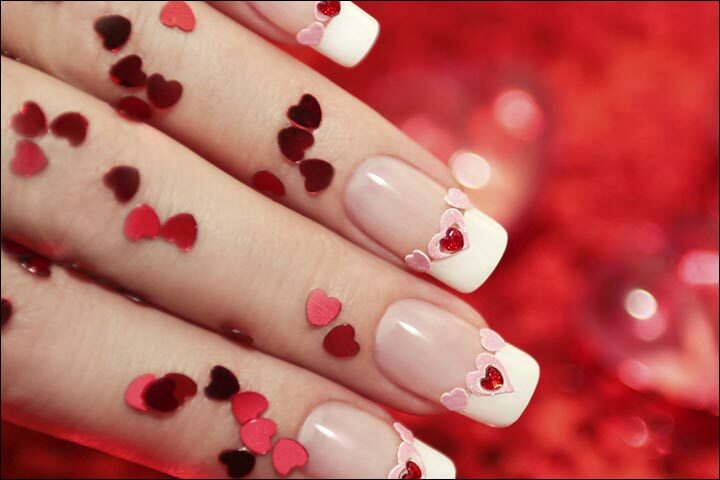 One of the cuter ones on the list, this can also double up as a valentine day themed nail art. It requires plain old French nails, nail stickers and red rhinestones. This design is one that requires you to paint French roses on your nails, if you aren’t sure about it, you can simply buy French rose stamps that are available in the market. A very simple yet absolutely beautiful quick and easy styled nails that can be done in a jiffy! Watch the video for the step by step instructions. It looks complex, but as you see through the list, it is pretty easy like the rest. All you need is a glitter nail polish, a dotting tool, which you can replace with a toothpick and a white polish. This wondrous idea is much more simple than it looks. 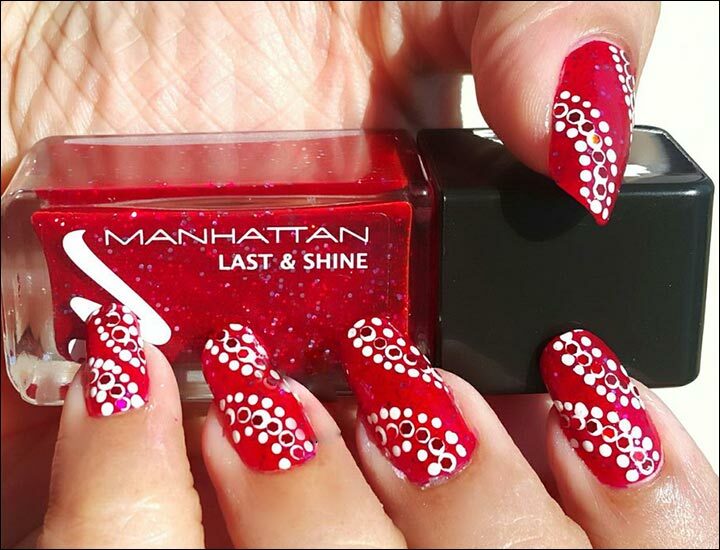 You’ll need a red nail polish, gold glitter mixed with clear polish and various rhinestones to recreate the whole look. 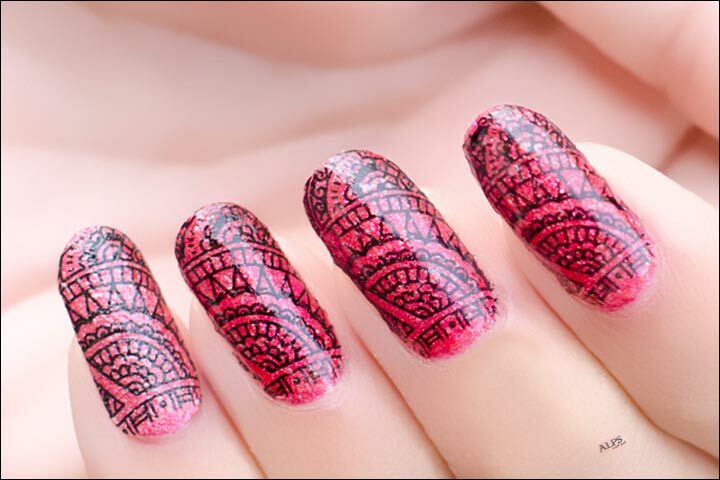 This extremely laborious looking detailed nail art is in fact a quick and easy one. 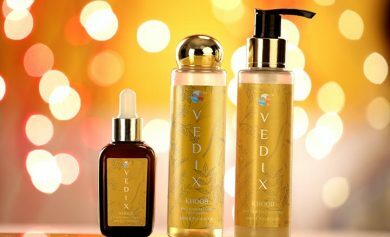 Watch the video to know more. A three colour combo, this gloss sans sparkle art piece is a sober masterpiece. 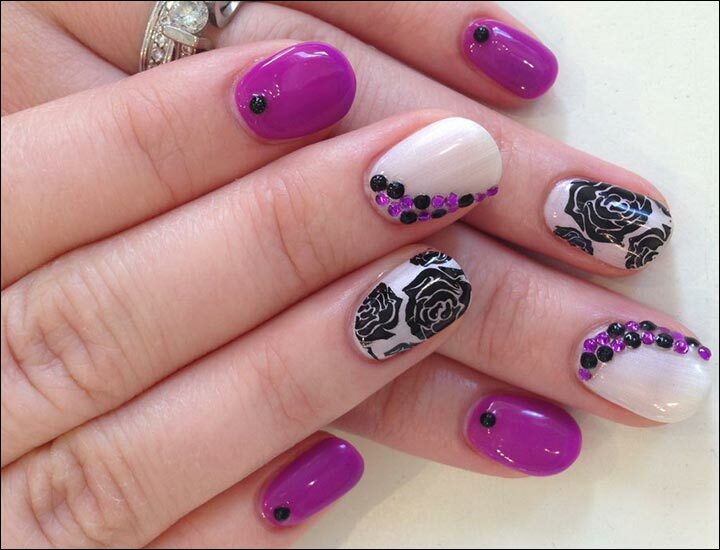 An easy to recreate idea that only requires purple and white nail polishes, a black rose sticker and purple and black rhinestones. This white simplistic beauty shouldn’t be neglected. 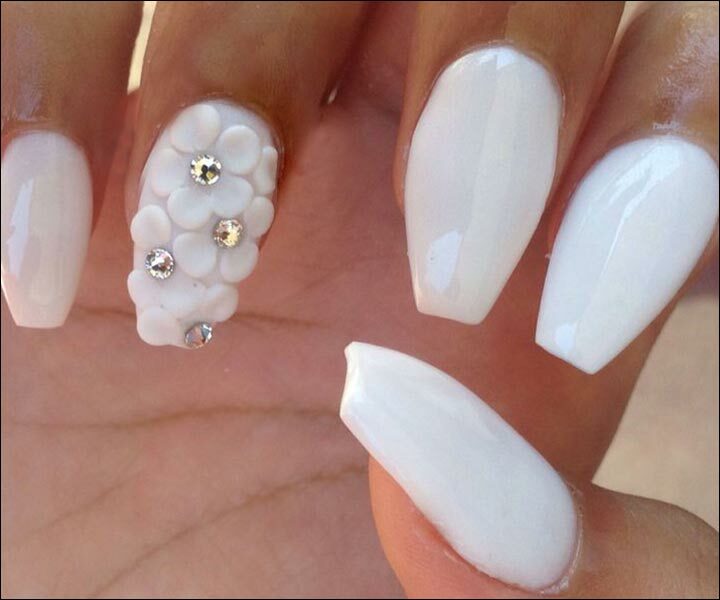 To get this look all you need to grab is white nail polish and white acrylic petals and silver rhinestones. 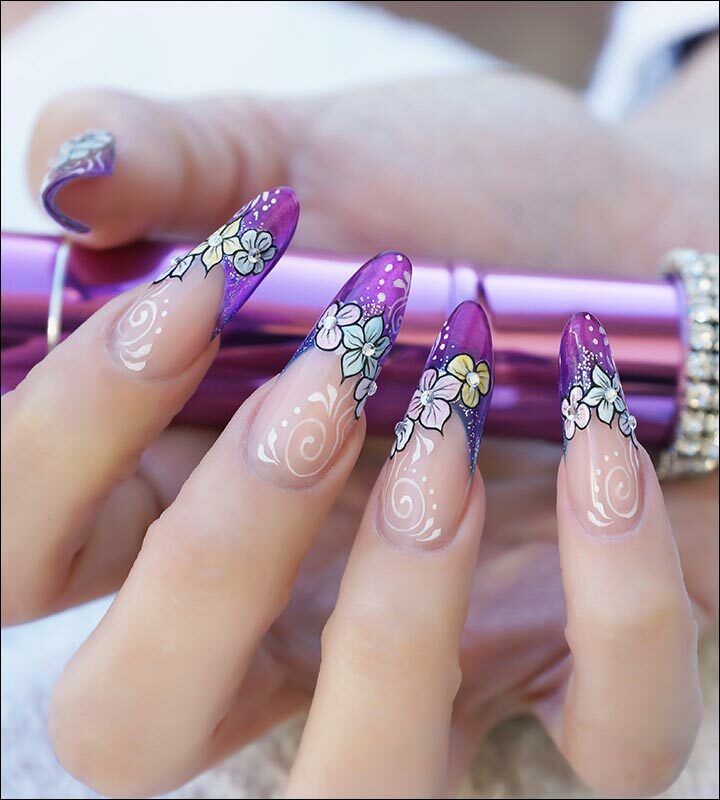 Even though its slightly tricky to recreate this particular nail art, if achieved, it will look incredible and you’ll definitely be proud of your work. If you don’t want to risk it but still want to recreate the look, you could try using stencils or stamps. 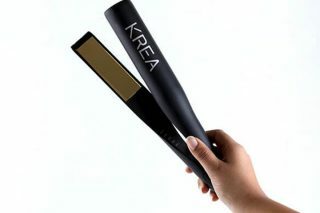 You’ll need black and skin colored nail polish, a fine brush and some really cool artistic skills. Another extremely professional yet DIY must try video that features the bride and groom. This nail art will make every girl wish she had your nails. 33. Would This BEE The Bridal Nail Art For You? There you go, here are our 33 most amazing, chic and stunning nail art ideas to choose from for your wedding. 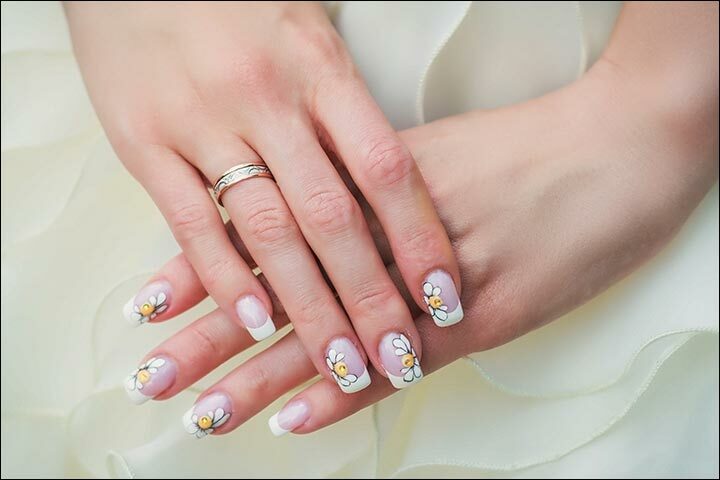 We know nail art can be tricky and you may have tons of questions about its application specially for your wedding day. 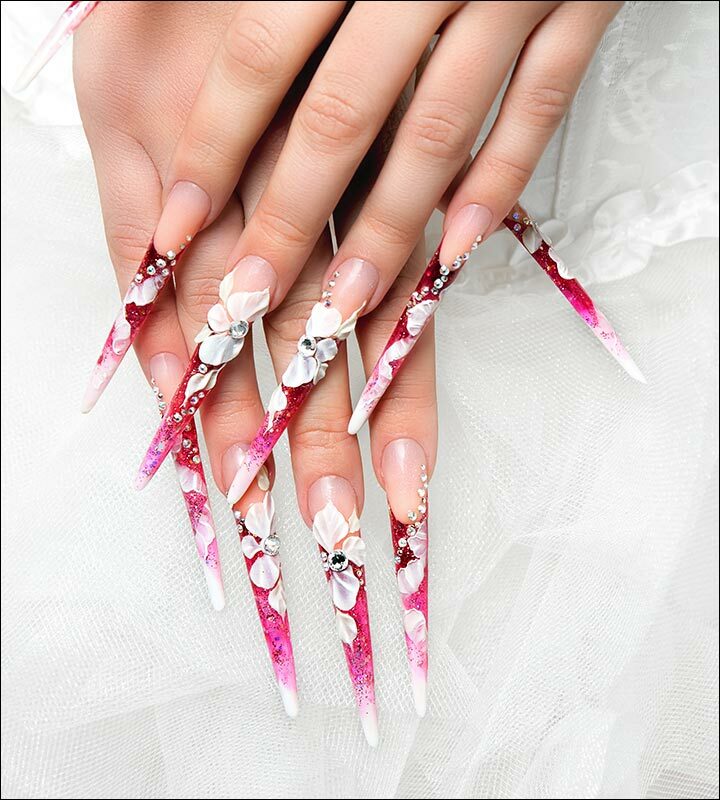 We have put together a list of commonly asked questions on bridal nail art below, if you still have more questions, drop us a line in the comments section below and we will get right back to you.